Smooooooth Easy Deal! Always great quality! Quick to Ship! Thanks! Item arrived in excellent condition. Very pleased. Great looking pouch, and it snapped right on to my original pistol belt. It came in excellent condition, and was exactly what I expected. This magazine pouch is great. The snap fit perfectly. Great quality. The misplaced snap button is not an issue at all, and my -ahem- airsoft -ahem- mags fit perfectly. Very fast shipping, exceeded my expectations. The quality product fit on my belt with no difficulties. Extremely satisfied and will shop with you again. was supprised how fast the ammo pouch shipped, in spite of being shipped from across the world! very nice product. it fits my pistol belt perfectly. Looks just like the original. Top quality! The quality of the ammo pouch is very very good. I continue to enjoy the service of WPG especially the swiftness of delivery. I will always be dealing with you. Great job. Honestly, the color drew me to this magazine pouch rather than functionality. I'm inclined to favor a more yellow khaki rather than a more green shade of OD. Appears to be a very accurate reproduction based on photos I've seen of the original. Well made and the magazines fit nicely. 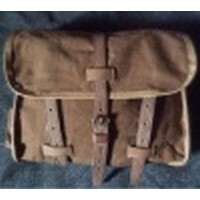 This is a nice ammo pouch and I have already snapped it onto my gun belt! Very nice, exactly like original, but clean and new.